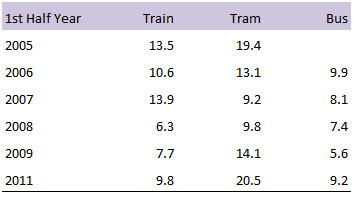 Is the 9% increase in public transport fares…fair? Many people are outraged that the Government has dared to increase public transport fares in real terms. From 1 January, fares in Melbourne will rise by around 9%, well in excess of the rate of inflation (3.6% for the 12 months to the September Quarter). From what I can make out, I don’t think anyone is questioning the need to increase revenue for public transport. For all its virtues, the system needs billions spent on things like improved signalling, track upgrades and duplications, more train sets, new rail lines, improved security, and much more. Patronage has grown at around 5% p.a. and that increases costs. Indeed, spending more to improve the system is the key to sustaining increasing patronage. From other transport activities with undesirable side-effects e.g. congestion pricing; levy on car registration. Each of these sources might be able to contribute something, but the revenue task is huge and there are practical and political limits to how much each can put in. 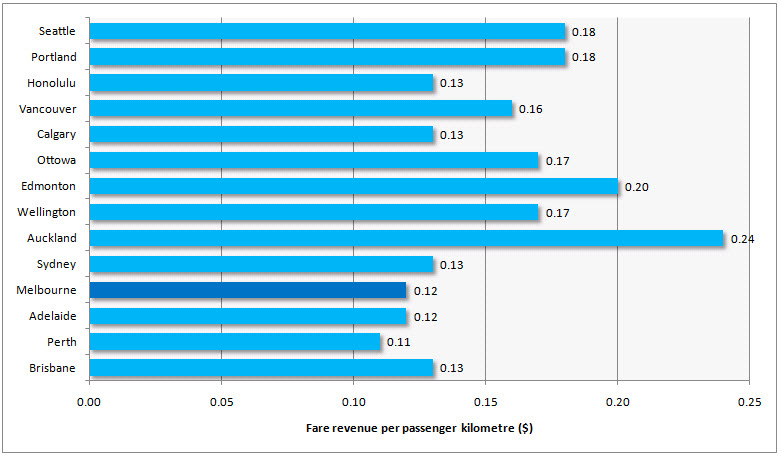 Fares are an important tool because they directly link supply and demand and they have history. Paying for service is a well established principle in public transport – there are very few public transport systems around the world that don’t charge fares. Melbourne public transport users already get a pretty good deal – their fares recover none of the capital costs and only 44% of operating costs. 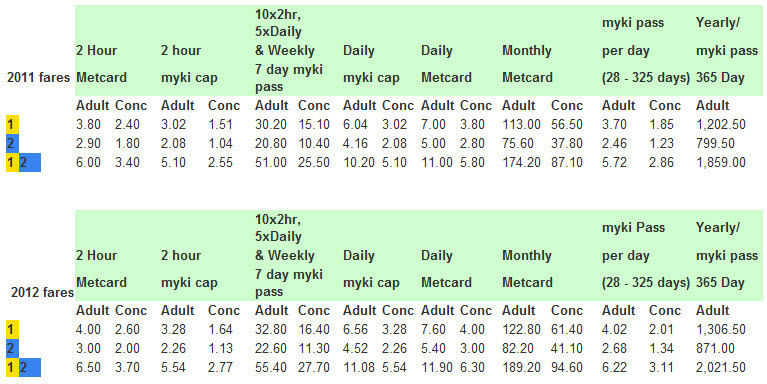 Moreover, judged against some other cities, Melbourne’s fares aren’t especially high compared to the cost of providing the service (see exhibit). The key market for the system is CBD workers who on average are reasonably well paid relative to their counterparts in other parts of the city. Further, a significant proportion of public transport users already benefit from concessional fares. Those who argue that funding should come from general revenue rather than from passengers don’t always think about what would have to be foregone. They often implicitly imagine it would be at the expense of something they personally see as valueless or negative (new freeway construction is a common target). But there’s nil guarantee of that. Any such decision would be made by the Government of the day according to its priorities and values. It might come at the expense of a very worthy transport project or it might come at the expense of another portfolio, perhaps a highly emotive one like education, health or community services. This attitude just shifts the problem to somewhere else where it might possibly impact others with less capacity than CBD workers. Does driving cost less than transit? 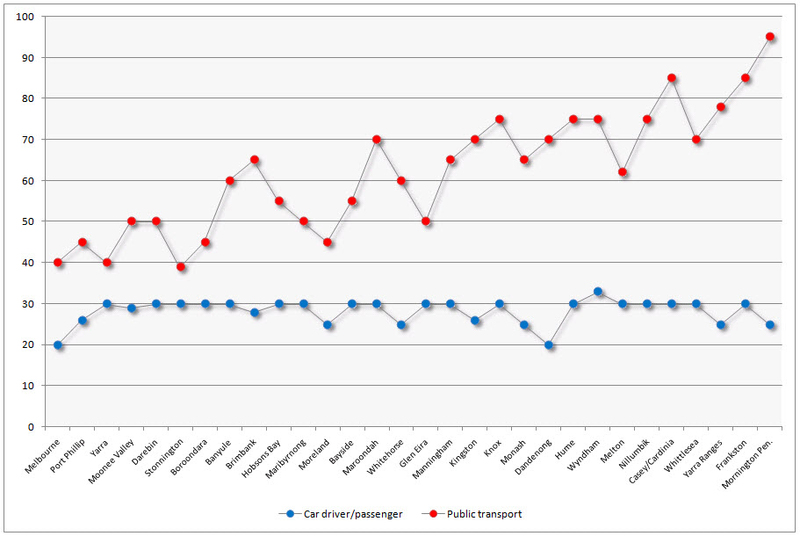 With petrol prices spiking upwards, it’s a good time to examine the relative cost of driving versus public transport. You can save a lot of cash if you’re prepared to live without a car, but you’ll pay in other ways. According to the RACV’s 2010 Driving Your Dollar survey, it costs $10,668 p.a. on average to run a medium sized car like a Toyota Camry Altise. The cost could be as low as $6,759 p.a. for something small such as a Toyota Yaris or as much as $19,234 p.a. for a behemoth like a Toyota Landcruiser GXL. On the other hand, a zones 1and 2 Yearly Metcard costs $1,859 p.a. for unlimited travel. However ticket outlays need to be adjusted for household size. In my case, my wife would also require a yearly pass and our two children would need travel concession passes. That brings the total cost up to $4,562 p.a., but that’s still considerably less than the Camry’s $10,668 p.a. Of course many children already have a school travel concession pass. And adults who know they have a limited travel range could probably get by with either a zone 1 ($1,202) or zone 2 ($799) ticket and buy extra daily tickets on those (presumably infrequent) occasions they travel cross-zone. Travellers who use public transport exclusively will in all likelihood spend more on taxis and occasional light truck rental, as well as sacrifice some spontaneity in trip planning, but in cash terms they should still come out well ahead of car owners. Whatever the overall saving is, it isn’t going to be realised by households who keep their car and simply use it less. The bulk of outlays associated with a car are standing costs like depreciation, insurance and registration. In order to be significantly better off in cash terms, a household either has to lose a second car or decide they can get along without any car at all.